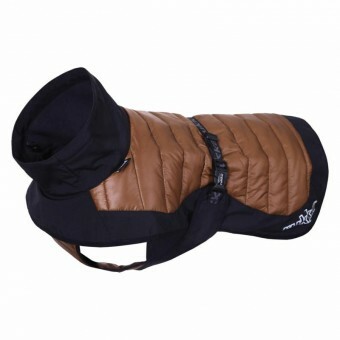 A lightweight and stylish hybrid coat quilted with special wadding for all kinds of outdoor activities. The coat combines soft, down-like wadding, which absorbs air, with functional and windproof softshell. This way a lightweight and well-insulating coat has been created. This type of coat is widely used in sports. Wadded panels to keep the dog’s muscles warm and a hem panel made of softshell material with a soft lining to protect the dog from splashing water and mud. The ripstop weave of the quilted fabric combines lightness with density and gives a stylish finish to the fabric. The water-resistant coat can be used by itself or as an insulating mid-layer, for instance, under a raincoat. Thanks to the quick buckle closure, the coat is fast and easy to put on. The adjustable elastic band in the waist helps to keep the coat in place. Elastic rear leg straps ensure that the coat stays in place in all conditions, also in activities of higher intensity. The coat has reflective piping and logo.